I’ve got no bright idea. Yes, it’s been a long time. I know. I’m awful. Every terrible thing you’ve ever thought about me is true. No more calorie counting apps. After much thinking, I decided to delete MyFitnessPal from my phone. MyFitnessPal has this thing where it lowers your daily goal calorie intake as you lose weight. The last time the app offered to lower mine, it told me I should only have 1200 per day–which was also the absolute the absolute minimum. If I ever logged fewer than 1200, I would get a big warning about how I hadn’t eaten enough, which I then took as license to have a bowl of ice cream–for health! MyFitnessPal essentially recommended that 1200 was both the minimum AND maximum amount of calories. I didn’t feel I could trust it anymore. I also didn’t really appreciate it’s little judgmental comments after I entered in some foods. Yes, MyFitnessPal, I know mac and cheese is high in saturated fat, but I need it sometimes, okay? You’ll never understand. I haven’t been on a scale since July, which, incidentally, was just a few weeks after I purchased my own scale because my gym doesn’t have one. (Way to plan and spend wisely, Stonebarger.) This wasn’t really a conscious choice–I just got tired of seeing the yoyo-ing every week. I’m sure I’ll dig that scale out of the closet eventually, but not now. At last count, I was still at 100 pounds lost after hovering for several months, and I’m still wearing the same clothes, so that’s good, right? At the very least, I haven’t reversed the last couple of years of work. Better have some celebratory pizza! Meal planning and prep make a lot of sense in theory. You work hard for one afternoon, and your food is all ready for you the rest of the week. But you have to THINK and SHOP and PLAN and COOK. I’m currently in a place where I’ll do breakfasts and lunches for the week, but prepping dinners seems like too much work. There’s a line of preparedness that I can’t cross yet. I’ve even obtained some cheap cookbooks to help in the endeavor, although I tend to thumb through them and decide that most of the recipes have too many ingredients and must therefore be extremely complicated. Last fall, in a fit of setting goals for myself, I decided that I should do the half-marathon at the Oklahoma City Memorial Run on April 24. Yes, that’s right–despite my repeated promises (mostly out of spite) that I would not ever become a runner, I have signed up for half of a very long race. Probably because I might be a masochist. Luckily, Jackie Lease of Jackie Lease Fitness has helped me adapt and expand a Hal Higdon 12-week program into one that should ensure I won’t bite the dust before my next birthday (which is in May, if you want to get me anything). Don’t get too impressed by that half-marathon day that’s marked off. I did those 13.1 miles on the elliptical. In case you’re wondering why “rest” is already marked off for this week, I completely overslept on Monday and had to take it early. I already feel guilty. I don’t need you adding to it. It feels good to be back on the blog again. Plus, when I inevitably die of plantar fasciitis or toe cramps, I’m sure you will all cherish these mile logs with something like indifferent resignation. Over the next few weeks, a lot of people will try to tell you the secret to having fitness willpower over the holidays. Know this: these people are dirty, stinking liars who do not deserve your attention. For only I, Mistress of Overeating, have the secret to staying strong during November and December. And because I’m a Ravenclaw, I want to share this knowledge. I SURRENDER BEFORE YOUR SAVORY MIGHT. Because here’s the real secret to avoiding holiday overeating: you can’t. It’s impossible. You can’t even escape the sheer amount of food. How can anyone be expected to resist it’s deliciousness? The only choice is to accept that you are a flawed mortal with the inexplicable need to cram impossible amounts of carbs and sugar into your face during the last two months of the year. Just accept your inevitable food pregnancy and prostrate yourself before the altar of gluttony. The only hope to keep yourself out of a full-on good coma is to maintain an exercise regiment. Other than that, all bets are pretty much off. If anyone needs me, I’ll be stretching…my stomach. On this, the final day of the 21-Day Challenge, I have a quick announcement. This should come as absolutely no surprise to anyone, but I messed up a total of five times in the last three weeks—and each time was due to me just not using my brain properly. In the lobby of my place of employment, there is a jellybean dispenser. Sometimes when you walk in at 7:30 a.m., you grab a few of the beans and are chewing them up before you realize that you aren’t supposed to be eating candy. Then you promise not to mess up again. Failures #2-#5: The Kind bars. During the second week, I ran out of breakfast granola bars. One morning, I stopped at a gas station, bought four Kind bars with nuts and chocolate, and ate them for breakfast the next four days because apparently I can’t be bothered to think through my decisions in the morning. 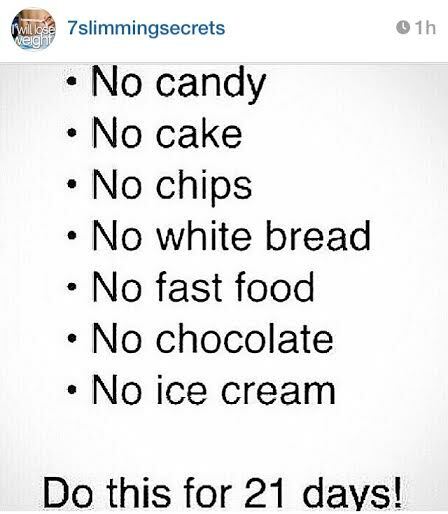 Chocolate was definitely on the list of “no” food. The bad (or good) thing is that I did pretty well on the rest of the challenge. Just those five times in what was otherwise three weeks with no chips, no cake, no fast food, no ice cream, and no white bread (as long as you don’t count pasta, which I don’t—BREAD AND PASTA ARE TWO TOTALLY SEPARATE THINGS, GUYS). According to my math, screwing up five meals out of approximately sixty-three means that I was about 92% successful. Not too bad, and certainly better than my performance on the other monthly challenges. Sounds relatively “okay” to me. And not to stray from the topic, but I even broke my 65-minute elliptical record on Tuesday. NBD. All in all, I’d say I feel relatively good about the 21-Day Challenge. Dare I say that I may even try it again in the future? But, you know, with less failing. And I have a week to figure out what October’s feat shall be, which basically means that I’ll wait until the thirtieth to search for fitness challenges on the Internet. Also NBD. Until about ten o’clock next Tuesday night. P.S. I’m totally having pizza this week. I’m actually surprised this whole post wasn’t about that and chips. At the start of the “Just Say No” 21-Day Challenge two weeks ago, I was feeling pretty smug with my flawless argument that pizza is not a fast food. The next day, someone pointed out to me that pizza has white bread, which I can’t have anyway during the challenge. So there’s that. This realization was a bit depressing to say the least. My affection for pizza is such that you might almost call me a human version of the Teenage Mutant Ninja Turtles—except I’m not a teenager, I’ve never come into contact with radioactive material (besides my cell phone), I am not acquainted with the ninja arts, and I’m not amphibious. I mean, you could say that I have a shell, but that’s really more of a figurative thing. Anyway, I like-a the pizza. I have no problem admitting that it’s probably an issue I should be concerned about, and I’m not surprised that I’ve gone through what I’m calling “pizza deprivation” over the last two weeks. But…but…pizza crust isn’t considered bread, though, right? Even that pizza with the pretzel crust? I’m kind of on the fence about it anyway, but maybe—no? Oh, okay. Maybe I could make my own pizza without white bread! No…no…I’m probably not going to do that. Cooking is pretty stressful. THE ONLY WAY TO CURE A STUBBED TOE IS PIZZA EVERYONE KNOWS THAT. Times were simpler then. I could just sit and watch Chip ‘n Dale: Rescue Rangers—hey, why isn’t that on Netflix by now? Or Gargoyles? Or Talespin? Or Doug? Or Darkwing Duck? If there’s room for Super Mario Bros. Super Show, there’s definitely room for all of those. Yes, it’s been rough, but I think I’m going to make it. The prognosis is good. I’ve also retained enough sanity to realize that the return of white bread needs to be a reduced return. I’ve lost six and a half pounds in the last two weeks, so I think that’s what my body is trying to tell me anyway. It only makes sense. Pizza and I will just have to rethink our relationship. For August, I gave myself the 15-Minute Challenge, where I would do some sort of extra exercise for 15 minutes every day. I’m not going to lie. I stopped doing that after, like, a week and a half. BUT I did increase my daily mileage by half a mile and I’m working myself up to the next level of resistance. SO THERE. I’m sorry. No one was being hostile. I’m just overly defensive about personal failures. Given my track record on these monthly challenges, I think I’ve pretty much proven that adding activity is not necessarily the way I should be going. It’s mostly a time thing. I’m already spending a bit of time on the elliptical, and it’s difficult to feel motivation to do a whole other thing, too. I’m sorry to disappoint you with my laziness. @7slimmingsecrets is an Instagram recommended to me by my sister. They post fitness inspiration quotes (that sometimes make me feel good), recipes (that I don’t make), exercises (that I don’t typically do), befores-and-afters (that I automatically compare myself to), and whatnot. Every now and then, the account shares a challenge, like this one I saw yesterday while scrolling through. Should I be worried that this isn’t on their page anymore? Probably not, right? Then I changed my mind. Perhaps it was fortuitous that I saw this on the last day of the month. It won’t be easy, but I’m gonna do it for these first three weeks of September. I can totally do three weeks…I think…maybe. Last week, I made the mistake of going to CVS when I was hungry. And because they keep all the candy by the registers, I could barely stop myself from adding three bags to purchase and eating them over the last week. I think I’m due for some time without it. I can’t think of any birthdays I’ll be celebrating for the next three weeks, so this shouldn’t be too terrible. I probably shouldn’t admit this in any type of public forum, but I’ve always been a big fan of Cheetos. I can sense that you’re already judging me, but those squiggles of edible Styrofoam covered in cheese dust are freaking delicious. As a matter of fact, there is an unopened bag of Baked Cheetos in the kitchen right now, calling to me. Luckily, it should keep for the next few weeks–actually, let’s be honest, it’ll totally keep longer than that for a lot of reasons. It’s highly likely that I eat more white bread than I realize. This might not work out well for me. It seems unpatriotic, somehow, to give up fast food for a while. This is America, after all–the land of golden arches, bells of tacos, and royal burgers. I hope I won’t be found guilty of treason. Let’s also get one thing straight. I don’t count pizza as fast food. It frequently takes longer than 20 minutes, which is not fast at all when you’re hungry. You can get served in a real restaurant more quickly than that. I guess I’m just saying that I might hurt anyone who says that pizza is fast food. You can’t make me count it. BUT DARK CHOCOLATE IS GOOD FOR YOU! Sort of. Ah, man. I had a farewell bowl last night. I think I’ll be okay. Crap. I’m already craving those Baked Cheetos. This is going to be even worse than I thought. Last week was a bad week, and for a lot of reasons–except for Friday. Friday was good. I felt like I was dying every day at the gym. There was pain. So much pain. And soooo much sweat. Even though I didn’t change any of my workout, my legs were on fire halfway through it. I didn’t want to sacrifice any miles, so I slowed my speed and upped the incline just to feel like I was doing something. I still felt like I was slogging through a tar pit–a tar pit on fire. Every day. I did make myself go the usual distance, but my legs were definitely not happy about it. I ate terribly (well, slightly more terribly than usual). There may have been a few too many snacks… and Reese’s peanut butter hearts… Goddammit, why are they so delicious? I might also still be eating emotionally due to the Sherlock finale. It was intense, guys. I’ve had bad weeks throughout this project, but nothing quite like this so far. I don’t recall regaining that much weight in one week or having that much trouble on the elliptical since I started this thing last April. And to top it all off, I can’t honestly say that I’ve lost fifty pounds, anymore. Much like Alexander, who had a terrible, horrible, no good, very bad day in Judith Viorst’s children’s book, I am just going to accept that everyone has bad days/weeks at some time or other and move on. Even if there are people who have perfect weeks all the time, I think I’ll just lie to myself about it. Sometimes, there’s nothing wrong with a little denial. The good news is that there were no invisible, inflamed tar pits at the gym today–that I know of, anyway. We’ll see about tomorrow.